12 | November | 2014 | Coyote Moon, Inc. 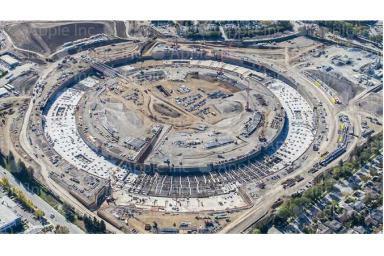 The City of Cupertino has posted a new aerial image that shows how the construction of Apple’s Spaceship, er, Campus 2 headquarters is coming along. The image details show the ring’s foundation as being complete; the city expects work on the actual structure to commence soon. The image can be a bit difficult to decipher. The central part of the image shows what will be the interior open space of the building, which will contain native grasses and trees, with places for employees to relax during hectic days. This center section, then, is the future ground level of the building. Read more on About: Macs. Coyote Moon is a trademark of Coyote Moon, Inc. All rights reserved. Original content on this site copyright Coyote Moon, Inc. 1996-2019.